- Bonus Cartoon: "Goofy & Wilbur"
Get ready to go a little bit country with Disney's all-new motion picture THE FOX AND THE HOUND 2. The music of today's hottest stars is center stage in this classic tale of friendship and loyalty. Tod and Copper still go together like an itch and a scratch but when Copper gets a shot at the big time with a nutty group of hound dog howlers, their purebred friendship is put to the test. As much as this reviewer loves all things Disney, he has never thought much about the company’s straight-to-video releases. But this “mid-quel” to the original 1981 classic really isn’t that bad. 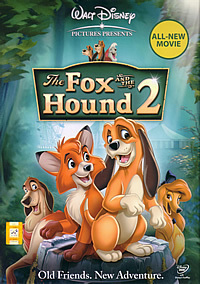 Do not be fooled by the “2” in the movie title, thinking that this is a cheap spin-off of the original film, where the kids of the original fox and the hound get together to milk money out of unknowing parents trying to pacify their noisy children. The story still centers itself on the original characters, and the two best friends find their way into a circus where one of them is given a chance at becoming famous. This puts their friendship to the test. How typical of a Disney animation to tap on heartwarming issues like that, we hear you say. But that is what The House of Mouse does best – making viewers young and old feel good about the niceness in this world. Since it has been a good 25 years since the first movie was made, expect to see advanced animation and a glitterier overall feel for this 69-minute picture. This may not be that good a thing, because of the stronger story development in the first movie. The more polished look here almost seems like an attempt to conceal this flaw. In fact, we miss the vintage clean animation from the original film. There are also some nice songs performed by country and bluegrass singers like Reba McEntire and Trisha Yearwood. It almost feels like the old brand of Disney musicals are back in town. Expect to hear characters break out in catchy tunes and lovely songs. The story may seem like a rehash of workable formula, but there is still a feel-good charm to it. If there is space to spare on your DVD shelf, this would make a nice companion to the first film. This Code 3 DVD contains some special features which seem like they are there for the sake of it – definitely not as impressive as the other Disney Classics’ special edition discs. The Making of The Music – The 10-minute featurette sees the bluegrass and country artistes praising the tradition of Disney music, and how they are prioud to be part of the legacy. “You Know I Will” Music Video – After singing on the soundtrack of High School Musical, Lucas Grabeel performs the end credits song for this movie. Bonus Short – “Goofy And Wilbur” is an amusing eight-minute clip where we see the silly Goofy going fishing with his grasshopper. “Mutt Mix Master” Game – Be a deejay and mix the different elements (strings, barks, percussion beats) on the desktop console and create your own masterpiece. The disc’s visual transfer is good enough for kids who want their cartoons crisp and clear, while there are 5.1 Dolby English, Portuguese and Spanish, together with 2.0 Surround Thai, Mandarin and Cantonese audio tracks to choose from.